I was asked about chatter. I've debated whether to answer. It's easy to make generalizations, and it's always the specifics that matter. You have to be observant and, well, flexible. 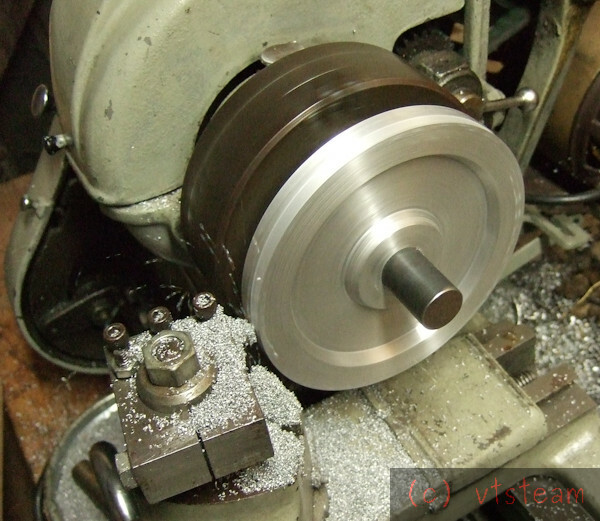 In a small lathe or flexible boring operation, yes chatter happens. But it's not necessarily a negative. Chatter is nature's way of telling you to slow down. Or sharpen your tool angles differently to suit the material. Or increase the feed. Or reduce the tooth profile. Or check that some part of your setup is starting to get loose. Or that you need to increase pressure in your gib screws. Or that you're too impatient. It's an alarm bell. You shouldn't get mad at it. It's there to help you do something different than you're doing. It's something to figure out. It's something to make you a better, more skillful and knowledgeable operator. It's a set of instructions for lathe design. If things work out perfectly, you don't learn anything. The first thing I produced after building my Gingery lathe was chatter. Then I learned more about tool sharpening. When pressing a bearing into a close fitting journal a LITTLE bit of chatter marks on the bore is a distinct advantage. The tight fitting bearing will slightly deform the ridges, and if you are using Loctite the troughs give it somewhere to sit without being wiped off. though, if chatter had been present near the end. I didn't intend a press fit, also. The bore gauge was about a half thou oversize, according to my cheap caliper. And the final fit felt close, but not tight. I haven't done tapered roller bearings before, and this is a split housing anyway, with shims present, so a drive fit didn't seem necessary. I'm assuming, that tightening up on the axial nuts in a close fit journal is sufficient pre-load, and bearing retention for the purposes of this lathe. .... I haven't done tapered roller bearings before, and this is a split housing anyway, with shims present, so a drive fit didn't seem necessary. I'm assuming, that tightening up on the axial nuts in a close fit journal is sufficient pre-load, and bearing retention for the purposes of this lathe. Exactly. Idea of just a retention is good. No matter how good we hobbyis are, we still strugle to make bearing seat more round than bearing is. Tight fit is the professional way, when close to nominal loading is used, but then bearing seat must be made and measured to accuracy, that is pretty much out of reach. And because of modern glues no need to. Mechanical retention is the other good choise. We can fiddle with shims, nuts and stuff way longer than it would be practical in a professional seting. Thanks Pekka! The only iffy part in this whole construction for me was going to be using tapered roller bearings. Plain bearings I'm very used to. I'm very happy with how close the fit is on the gauge, at least. It feels proper for the job. Now if I can just do the same for the other journal, everything else on this lathe will be a piece of cake! Taper roller bearings are very good choice to this aplication, unless very high speed is needed (then angular contact bearings would be better). Taper roller bearing arragement is whole lot stiffer than same size ball bearing set. You have less wiggle room with taper rolle bearings. You may need to rotate the spindle and force it one way and then another. Tighten loading nut until spindle stops rotaing (under motor or manual power) and then wiggle/pound spindle a little with soft mallet until spindle rotates even. It is very important that spindle turns close to constant torgue, this will tell that spindle/housing is concentric. Repeat until no play (and spindle can hardly turn, but turns with contant power) and leave glue to set. This should force bearings to locate as concentric as possible. After glue is set (for outer rings), it is time to adjust play (or slightest preload) for testrun. This has worked for me, sometimes the spindle would refuse run right and I had to take it all appart and assemble parts in diferent orientation. Shims are very wedgy and all nuts run askew. This journal is going slower than the other...must be where there was some sand inclusion. I can't see anything, but I have to sharpen the bit after every second bore increase, I'm quitting for the day, there's 0.300" left to go, and MAYBE I'll get through that tomorrow. 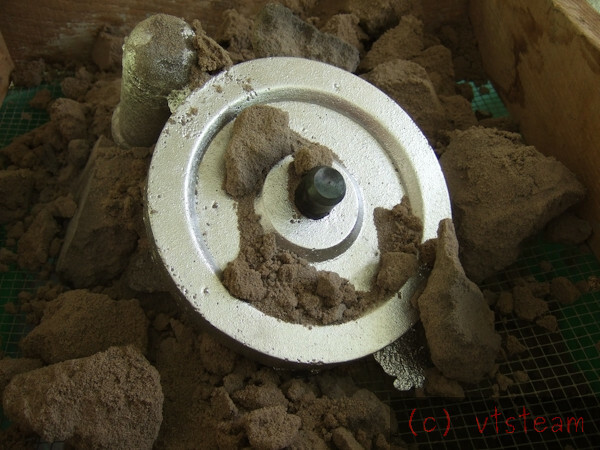 Next time I do anything remotely like this again, I'll use a baked sand core in a core box instead of a greensand core, and shape it with journals in place, and a LOT closer to finished bore in size. I chalk this LOOOONG boring, boring session up to a few years of forgetting about what I used to do. Oh well, almost done. Bravo!! With the paint, it looks like a professional job! I am curious though; do you plan for any bearing covers to keep swarf out? Yup, bearing covers, BUT I'M NOT BORING THEIR RECESSES ON THE LATHE WITH A 24" LONG BORING BAR AND HSS TOOLS!! I'm going to use my mill, and a brand new genuine carbide tipped boring head I received in the mail! . Had enough of the Gingery line-boring have you? Nothing wrong with that. I met my match with 2 inches of sand entrained Zamak vs hss. Catching up on house chores for a day. So I've been out of the shop. I think the next thing to do will be cast a spindle pulley. 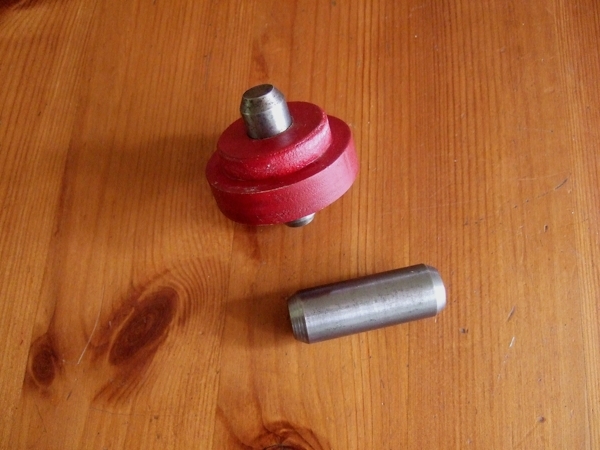 The spindle necks down for a few inches at the left end, and the threads and retaining nuts are at the bitter end. So there's no way to put tension on the bearings (and therefore install them) until there's at least a sleeve (or extended pulley hub) on the left to bear against the leftmost roller bearing and put pressure on the assembly. The spindle is a force fit in the bearings, so nothing is assembled yet. Might as well be a pulley, then. Likely a toothed belt, but I haven't decided on the exact type yet, nor the size of the pulley(s). The treadmill motor is rated at 2.5hp @130 DCV 18A @ 6700 RPM nameplate. but I doubt it will run anything like that speed, from experience. Or HP. That must be no-load speed. I had no trouble boring at ~100 RPM w/ a crude 5" to 1.5" vee belt reduction. I'm thinking XL Belt, 18T on the driver and 90T on the driven pulley. Those are two easy numbers to do on my spin collet, lacking a dividing head, since it does degrees. I should get about 1000 RPM top without a change in the driver pulley. That pulley would be 5.68" diameter. So I can make a 6" pattern. 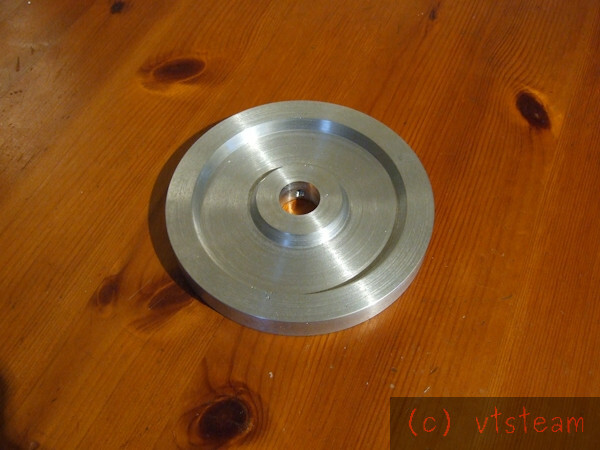 Aluminum, this time, for easier notching. Raining today, and had to prepare for my daughter's birthday, but I managed to make the pulley pattern, which I turned from poplar on the Gingery lathe. Rain predicted for the next few days. I'm going to try casting today between rains, if I can. This morning I found an older driver pulley pattern and turned up a new steel core for the driven pulley. These will stay in the mold. The tapered ends allow easier positioning. After cleaning up both sides, boring for an arbor and adding a setscrew, turning the blank down to the needed 5.684" on the Craftsman lathe. The finsihed pulley blank, ready for toothing, and then final boring to fit the spindle. That is a nice looking casting. Thanks Tom. How is your casting going? I remember you really had a nice set up. I'm thinking about a cutter for the pulley teeth. Normally I'd do another fly cutter with a lathe tool as a single point. But I'm worried about my spin collet holding. It's an old 5C type, and I remember that with past gear cutting attempts, that I had problems with it slipping. The vibration of a single tooth cutter and multiple passes is something I'd like to get away from, if possible. It seems like cutting 90 teeth without a single mistake is a fairly difficult proposition (for me, not you reading this!) , but I'm of course going to rush in anyway. 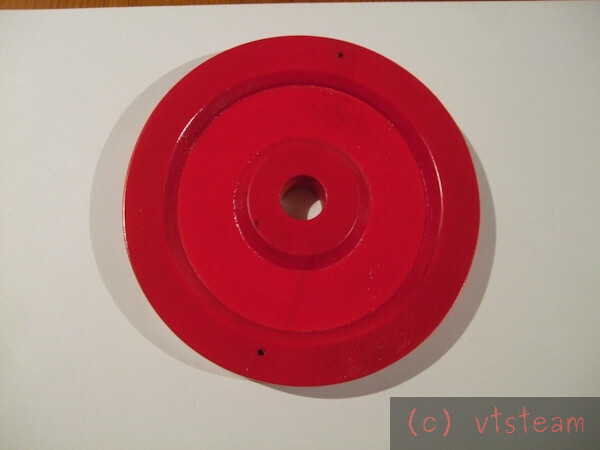 I'm going to have to keep my wits about me as there is a 36 hole disk, with a ten hole "vernier" to yield 360 parts. This means I will have to cut once, then peg the #4 hole, cut, peg the #8 hole, cut, rotate disk one and peg the #2 hole, cut, then #6 hole, cut, rotate disk one, etc. Also advancing X. If I have a multi tooth cutter, and if I can get away with a single pass, no Y traverses. Otherwise, multiple Y moves, then return. Many chances to ruin the blank. So that's why I'd like a multi tooth cutter. I have in mind the way I want to make one, using the lathe to first turn the profile, then milling teeth somewhat like I made the Acme tap, a long time ago in this lathe thread. I just have to research the angles and settings I will need to get there. The depth of tooth and diameter of the tool stock will determine how many teeth I can have -- I'll probably use that 1-1/8" ground stock that Lester sold me as "cold rolled". 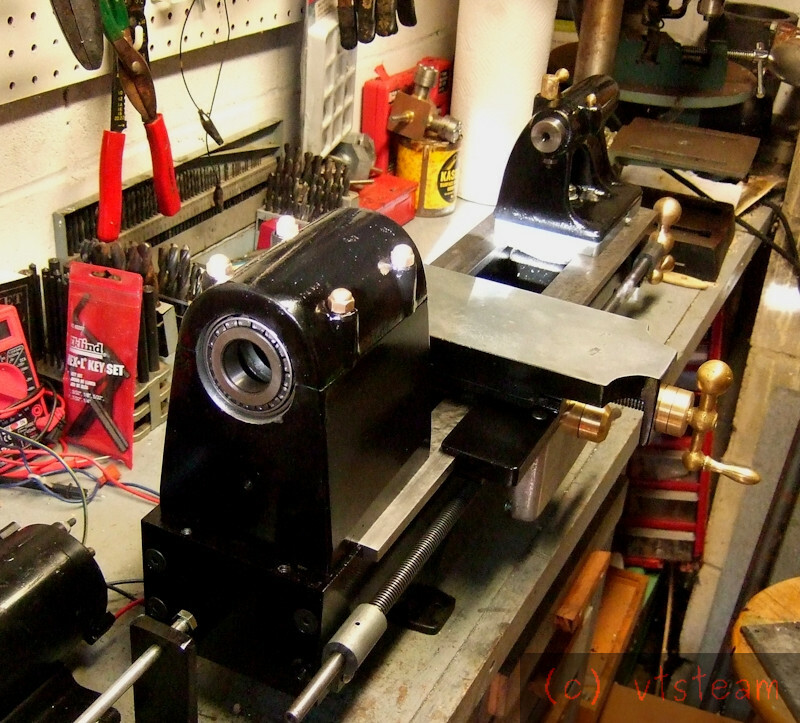 Beautiful stuff to machine, and I suspect it may be really drill rod and hardenable. If not, I have some real Kasenite as backup.